Drivers across the county are being warned to avoid the A27 in Fontwell as it remains closed after a car collided with a lorry. A woman and child escaped the car after it overturned between the Tangmere and Fontwell roundabouts at around 2pm this afternoon. Click here for the full story. The A27 remains closed eastbound between these junctions, with a Sussex Police spokesman saying it ‘should be open soon’ after a call from the paper. 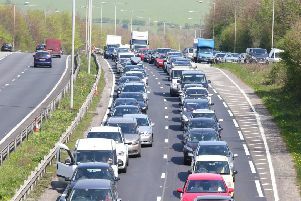 But traffic reports suggest it is causing seven-mile tailbacks to the Chichester Bypass.